Prior to linking up with Ricky Wayne, our band had done school dances. Our biggest gig was a social club in New Cross. London. Spurred on by winning a heat in the Guinness pick of London talent contest, we went to an audition in London. There were these bands knocking out "Walk don't Run". We thought that they were good. But at the end Ricky came up to us & asked us to be his backing group. Frankly, we'd never heard of Ricky. We were totally unprepared for what was to happen; which was that we had the most amazing 6 months. After rehearsing for weeks we started doing gigs around London. Then Ricky hit us with " next week we are at the Lyceum "; we played there several times. One Wednesday, we did our bit (just 3 numbers), and then dashed off the Dorchester Hotel in Park Lane, to do Charity gig. I remember the Ladies of debutantes sect, looking us up & down as though we were something that the cat had just dragged in. We chatted with Noel Harrison & George Chakiris of West Side Story fame. Then we went on; what we didn't realise was that the Duke of Edinburgh was in the audience, and that we'd performed before Royalty. It didn't actually change our lives. One weekend, we were in a package show in Aberaman, in S Wales. We got put up in a posh hotel. On the Saturday evening we all piled into a van to be dragged around various to publicise the package show on the Sunday. We went in to Dance halls and were introduced as international film stars. We might have been many things, but I think that the bloke was stretching the point just a little. As for the show itself; there were 2 Houses. Topping the bill was a singer called Gerry Dorsey, who had been in a team of singers o n a lunchtime TV show. We were Elvis & Buddy Holly, Little Richard, Jerry Lee fans, so Balladeers and crooners didn't interest us at all. That singer metamorphosised as Engelbert Humperdink. Though we were all on the same bill, we didn't see much of Gerry Dorsey, apart from him shouting at some girls who had tried to get into his dressing room. He told them to disappear. I remember that we decided to get some fresh air, from the theatre. We got as far the stage door, before we gave up after being chased by a load of girls and who were we? nothing really. After the show the local dignitaries had laid on a meal in the town hall. I will come on to other memories, if you wish such as the Teenagers fair, Joe Meek and all that. 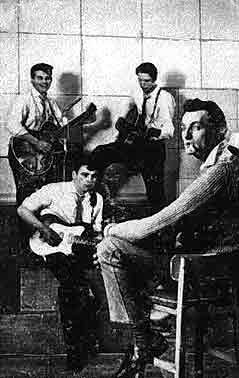 But where Lee Diamond & the Cherokees come is that in the Autumn of 1960 we fell out with Ray Mills, who was lead guitarist, although I also played lead. Lee had got up to sing and had knocked us out. Ricky Wayne was off doing gigs without us - probably because were still semi-pro . We wanted to link up with Lee, Ray Mills wanted to stay with Ricky. I saw Ray a few months back. I knew that he formed a new band of Offbeats. They even made a record with someone called Deke Arlon, who actually was an actor on Tvs Crossroads. I hadn't seen Ray since 1961.The Offbeats he formed were a very good band. 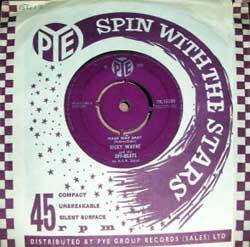 He actually became a regular guitarist for Joe Meek. He played with Sounds incorporated for a while, but because he decided to leave Sounds inc, missed out on the Beatles/Shea stadium New York gig where Sounds inc were the opening band. He told me that he backed people like Brenda Lee. Anyway Jaybee, if there is anything that you'd like to know, just ask & I'll try to answer your questions. I can send some Emails on Lee Diamond & the Cherokees, that I sent to a Ray Poole. The Emails will have Dear Ray at the top, hope that doesn't bother, unless somehow I can amend forwarded E Mails. I spend a lot of time recording my own instrumentals, so I'm going to get on with that now. I will get back to with other memories of that period.